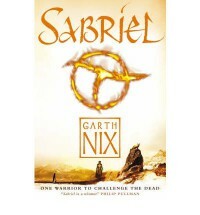 Sabriel is classic fantasy book that has been on my reading list since 2011 (according to Goodreads). Basically, I knew I wanted to read it since I first read the blurb, but for whatever reason, I didn't give it the attention I knew it deserved. Until now. Having finished the audio version yesterday - narrated by the fantastic Tim Curry - I find myself wondering: WHAT WAS I THINKING not reading this sooner? WHAT'S WRONG WITH ME? WHAT IS LIFE? Gah! Yes, this book is THAT good. I officially have a new favorite on my hands, and that hasn't happened in a long time.